Researchers in the Manchester School of Architecture have been awarded second place in the 2018 global Smart Ageing Prize for their project, PlaceCal. The prize is a collaboration between the Active and Assistive Living Programme and Nesta’s Challenge Prize Centre, set up to improve older people’s lives using accessible digital technologies. It seeks to find digital technologies that facilitate real world interactions to combat the issue of social isolation and loneliness among older adults. PlaceCal is a community events calendar designed to help people find out everything that is happening near them, all in one place. Its aim is to connect community residents and service providers with the small everyday events that are hard to discover but can be lifesaving for socially isolated older people, such as coffee mornings, sewing groups and computer classes. The project was developed by researchers at Manchester Metropolitan’s PHASE team and Geeks for Social Changes in response to research by the Hulme and Moss Side Age Friendly Neighbourhood Partnership that found that older people generally felt there was nothing to do in their neighbourhoods. Professor Stefan White from the PHASE group at Manchester Metropolitan University said: “We’re delighted to come runner-up in the Smart Ageing Prize. We are at a crucial point in the process of establishing the benefits of PlaceCal across the city and beyond and this win will contribute to enabling us to establish the PlaceCal Foundation – a stakeholder group that will guarantee the scalability and sustainability of a federation of PlaceCal installations. “After this, the social returns it generates can be calculated, recognised and reinvested so that we can develop and establish our delivery partners. “The pilot for PlaceCal was launched in 2017 and included events from Hulme and Moss Side. It had an enormously positive response from both residents and institutional stakeholders showing that there is clear demand for a roll-out from both individual neighbourhoods and institutional partners. The project was selected second place out of 95 eligible applications from all over Europe, Israel and Canada. 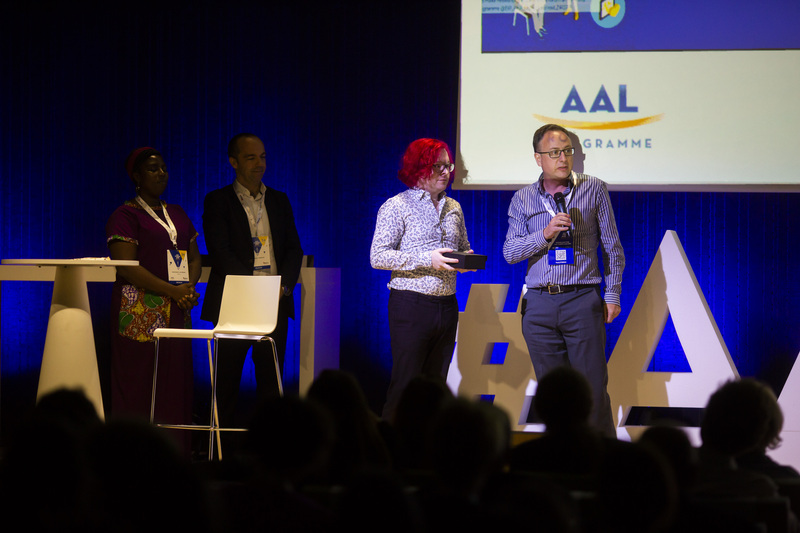 Five finalist teams had the opportunity to pitch their innovative projects on stage at the Active and Assisted Living Forum, after which the results were announced.